How to cook a two person portion:1. 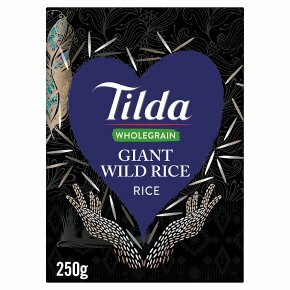 Place 125g of Giant Wild Rice in a large saucepan and stir in 450ml of boiling water.2. Return to the boil, cover and simmer for 45-50 minutes until the grains have popped.3. Take off the heat and keep the pan covered for a further 5 minutes then fork through the grains adding a knob of butter if liked.To shorten the cooking time, cover generously in boiling water and soak overnight.Drain and cook as above using 300ml of water for 20 minutes.